Callum and I have a project (well, he doesn’t know it yet, but I’m sure he’ll happily come along for the ride): we are on the hunt for London’s Best Burger. There are many things in this world that I love, but a good burger is pretty high up the list. Luckily, London is full of fantastic burgerias (is that a word? It should be), but there are just so many it’s almost more difficult to really find which ones are worth your money. 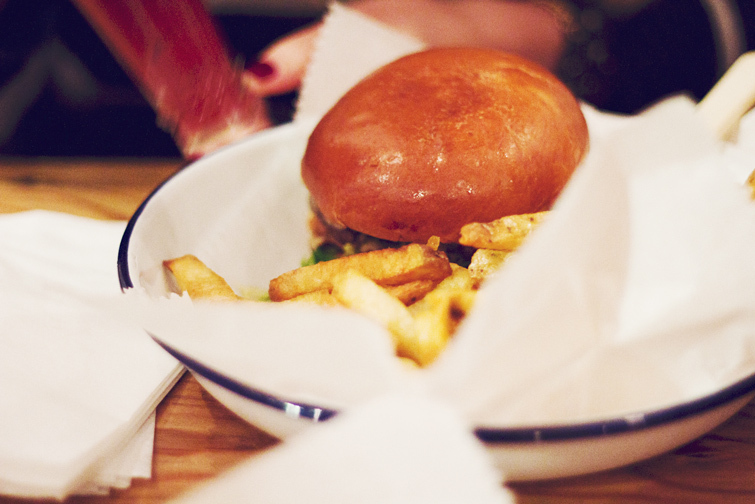 So the project is this – eat at restaurants across London until the perfect burger has been discovered. Yes, ladies and gents, it’s a hard life, but someone’s gotta do it. First up on the list (and setting the bar rather high) is Honest Burgers. Since setting up shop in 2011, Honest have become a household name amongst Londonders, and they’ve now got restaurants in King’s Cross, Soho, Brixton, Camden and Portobello Road. 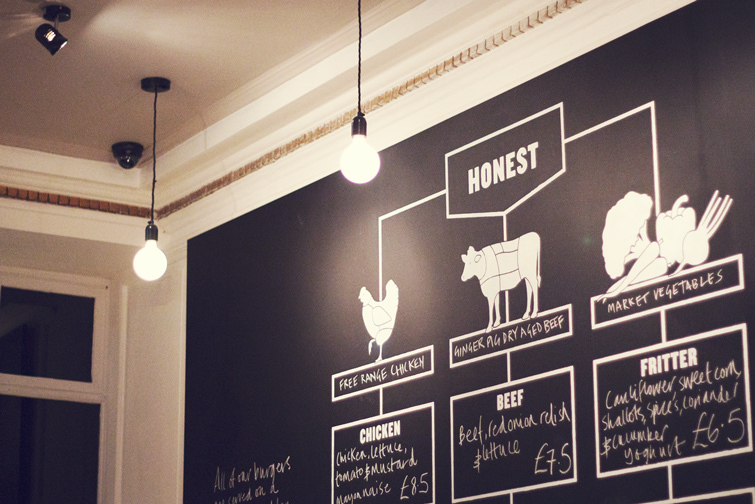 What I love about Honest is their simplicity – a concise little flowchart menu keeps the focus on the burgers, keeping sides and dressings simple and allowing the quality of the meat to sing. British farm Ginger Pig are Honest’s suppliers, and it’s great to see two British indies working together to put the emphasis back on top-notch produce. Honest’s burgers are just that – honest. Super tasty, simple, juicy bites of delicious burgerness (also not a word but should be). I love their rosemary-salted chips too, which have just the right amount of squidge, and their homemade lemonade is scrummy. I always find it difficult to resist a classic beef burger, so I haven’t tried the chicken or veggie styles yet, but it’s refreshing to see they’re just as much a part of the menu as the beef options. This is a burger bar that isn’t just for carnivores. Absolutely love the sound of the Brew Dog burger! I love their beers. The burger looks so delicious! So much love for Honest Burgers, I can’t wait till I can go back and eat there again! Thanks for you nice comment on my blog, love yours too! Very pretty and i love your style dear!